I was born in a non-Christian family in India. When I was young, as a family we performed various rituals. As I was growing up, I began to enjoy the worldly pleasures. My parents were not happy about it, so I planned to leave the house. Then, I was in search of a job, and I had the privilege of joining the Indian Naval Force. However, I was longing for real peace, so I indulged myself in sinful pleasures. In the year 1990 I married a believer. Her devout life impressed me to follow the Lord. However, I did not give up my bad habits. One of my friends shared Jesus' love with me, and I was convicted of my sins. I found hope and peace in the Lord Jesus Christ, and I received Jesus as my Saviour. While I was meditating upon the Word of God it was confirmed that God is calling me to serve Him. 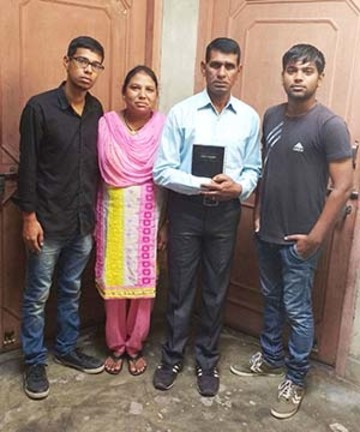 With the help of my pastor, I enrolled in a Bible School to equip myself to serve Him. 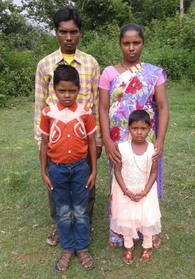 You can help support one missionary with a monthly donation of £25. When you become a sponsor, your missionary’s picture and testimony will be sent to you promptly.